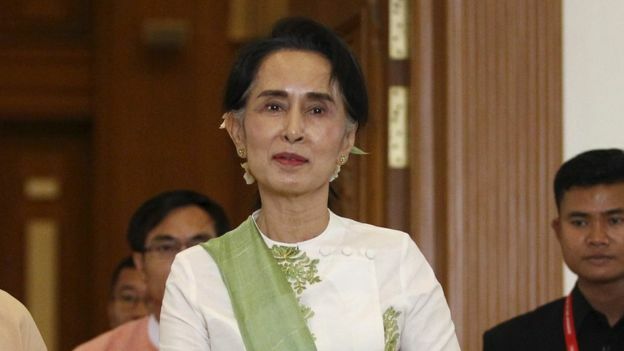 Myanmar’s new president has been sworn in, the first elected civilian leader in more than 50 years. Htin Kyaw from the National League for Democracy (NLD) takes over from Thein Sein, who introduced wide-ranging reforms during his five years in power. Although NLD leader Aung San Suu Kyi is barred from the presidency, she has said she will rule by proxy. The handover completes the transition that began after the NLD won a landslide win in elections in November. Htin Kyaw, 69, said he would be “faithful” to the people of Myanmar, as he took the oath of office in a joint session of parliament in the capital Nay Pyi Taw. Vice-presidents Henry Van Thio and Myint Swe, who lost to Htin Kyaw in the presidential vote earlier this month, were also sworn in, as were new cabinet ministers. Most of the ministers belong to the NLD. The list includes Ms Suu Kyi who will be in charge of foreign affairs, the president’s office, education, and energy and electric power. But the military is appointing its own nominees for three key ministries – defence, home affairs and border affairs. Htin Kyaw, 69, is Ms Suu Kyi’s close aide. He attended university in the UK. He has a reputation for honesty and loyalty, and has kept a low profile. His father, the writer and poet Min Thu Wun, won a seat for the party at the 1990 election. His wife, Su Su Lwin, is the daughter of an NLD founder, as well as being a sitting MP, and a prominent party member. He has played a senior role at the Daw Khin Kyi Foundation, the charity founded in honour of Suu Kyi’s late mother, and has been frequently seen at the NLD leader’s side, serving as her driver from time to time. In a brief speech, Htin Kyaw noted challenges ahead including the need for a nationwide ceasefire. The government has been engaged in armed conflicts with various ethnic groups for decades. He also spoke about the constitution complying with modern democratic values, in a nod to the NLD’s stated goal during the election campaign of changing the constitution. Correspondents say this is perhaps the most sensitive issue in the NLD government’s relationship with the army, who have 25% of parliamentary seats. It means the army retains the power to veto any changes to the constitution, as that would require more than 75% of votes. The constitution contains a controversial clause barring anyone with family members who have another nationality from becoming president – widely seen as aimed at preventing Ms Suu Kyi from taking power, as her two sons are British. Despite the restriction Ms Suu Kyi, who remains hugely popular and prominent in Myanmar, has vowed to act “above the president”.